Then last novella written by Arthur C Clarke, one of the greatest writers of the classic science fiction age, ended with almost an open invitation. Its protagonist, Howard Falcon, half man, half machine was to be an ambassador between humanity and a machine culture, which was not the focus of that story, “in the troubled centuries that lay ahead”. Two of the biggest names in the British sci-fi scene have taken up the challenge of chronicling those troubled centuries. Baxter, off the back of his Long Earth series written jointly with the late Sir Terry Pratchett, and Reynolds revisiting some of the themes from his recent space opera trilogy – Poseidon’s Children. 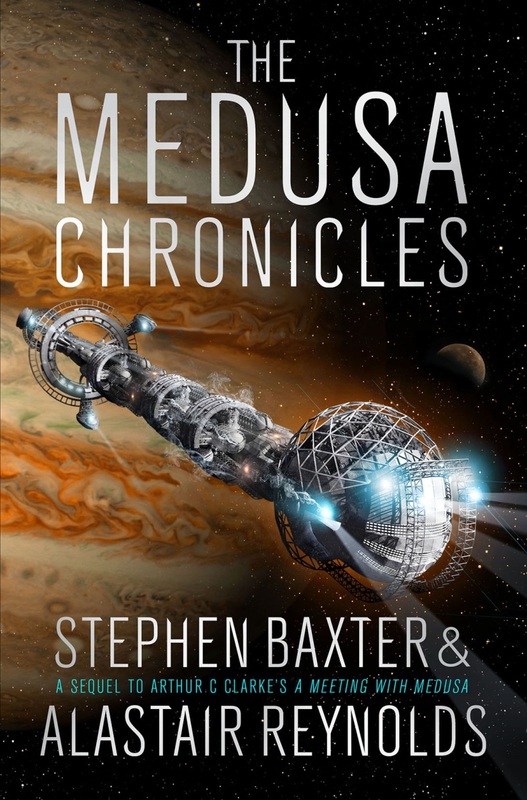 The first thing to say about The Medusa Chronicles is that, without being slavish, Baxter and Reynolds have tried to capture the feel of 1960s science fiction. Although it dips heavily into some ideas from modern physics, the book has a ’60s feel. This is both to their credit and, ultimately to the book’s detriment. The whole narrative exists in an altered imagined future in which a joint space effort in the late ’60s to avoid global disaster kickstarted a much more vigorous space exploration program, landing a man on Mars in the 1980s. The Global Government that follows is very much in the utopian Star Trek mode of the time, although Baxter and Reynolds are then keen to pick that hegemony apart. Howard Falcon, constantly upgraded over the centuries to be the conduit between the human and machine cultures is an interesting character but not a particularly engaging one. Again, he feels like the kind of plot-device character that populated (and still populates) big idea sci fi. Falcon almost exists to be a mouthpiece for the rational third way between the inscrutable plans of the machines and the violent reaction of humanity under threat. The book suffers from being over ambitious. By trying to cast its eye over a six hundred year time span it necessarily has to skip quickly through the intervening centuries. With the exception of the long lived Falcon himself, characters come and go quickly, connected through a tenuous, and fairly unbelievable family line. Falcon uses this time to do Baxter and Reynolds version of the solar system grand tour touching down on Jupiter and its moons, Mars, Mercury, the Oort Cloud and the Kuiper Belt. As a result, this feels like a series of open ended short stories. Possibly the best comparison (again for both good and bad reasons) is the Foundation trilogy, but even Asimov moved away from this time-skipping short story structure in his later years. The book is a perfect storm of Baxter’s big science ideas and Reynold’s capacity to create massive mysterious space objects. At one point the machine culture builds a massive structure above Mercury to harness the power of the sun. In another, they turn the whole of the surface of Jupiter into a giant weapon. But characters are always keen to point out that even while creating inertialess drives that can move moons they are obeying the limitations of Newtonian physics. Many of the greats get a shout out, a reference or a mention- Asimov’s three laws of robotics, HG Wells, Jules Verne, even Jonathan Swift. But overall this a homage to Clarke and his main themes – artificial intelligence, space exploration and a fixation on Jupiter. The movie version of 2001 gets a mention at one point and the finale has definite 2001 feel to it. This is interesting, retro sci-fi but not quite as good as the best of Baxter, Reynolds or Clarke. An edited version of this review first appeared in Aurealis #93, Australian Science Fiction and Fantasy Magazine, www.aurealis.com.au.